One of the more underestimated materials for countertops is soapstone. Soapstone offers durability, combined with beauty and ease of care. It never has to be sealed, and will probably last longer than the house where it’s installed. Soapstone is a highly dense stone, which means bacteria have a tough time sticking to it because it just isn’t porous. It can withstand some heat, as well, and while it isn’t as heat-resistant as granite, it is sometimes used as a hearth or fireplace material. Initially, mineral oil is applied to soapstone after the installation process, and the oil is buffed out with a clean rag. Some homeowners enjoy the dark, gorgeous sheen brought out by the oil and will continue to apply it at regular intervals. Others will rarely oil the soapstone unless water begins to leave a dark spot in its wake. Soapstone sinks can be oiled. However, the oil with dissipate with the use of dishwashing detergent, so some homeowners don’t bother. Soapstone can also be sanded, so if it gets a scratch, a light sanding and oiling can do the trick. Soapstone has a natural matte feel to it. 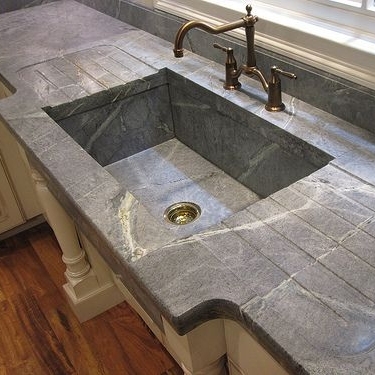 For this reason, homeowners seem to have a tremendous affinity for soapstone. Something about the way it feels is very ‘drawing’ to those who have it installed in their kitchen. Because soapstone is a quarry stone, the texture varies from piece to piece. Soapstone is formed in areas high in talc, which is how it gets its ‘soft’ appearance and coloring. Much of the material used has a higher percentage of quartz in it, which makes this stone suitable for utilization in countertops. It’s not a created composite, and it’s not uniform, which adds to the unique properties of each piece. The ‘soap’ name comes from the fact that it feels like a bar of dry soap! See the greenish hue? Lovely. Gray, blue gray, green gray, or dark gray-to-black are the only choices in soapstone coloring. Aging changes soapstone, making it look darker and more ‘weathered.' 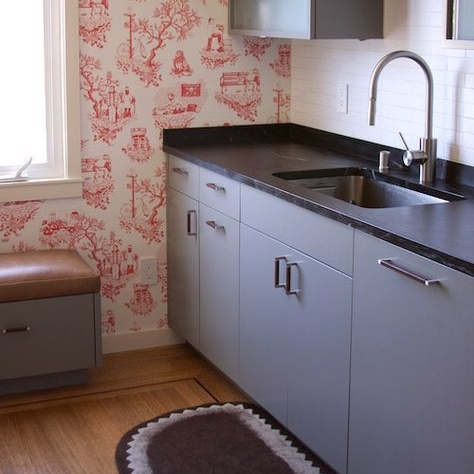 Since soapstone is highly durable, it can be found in old kitchens, where it has been installed for a very long time. Age and use give soapstone a weathered, well-loved look. Soapstone is one of the easier stone materials to install. Because of its forgiving nature, mistakes happen less frequently with soapstone. One caveat: it’s a weighty material, and that’s a consideration during the installation process. Nonetheless, an experienced installer can make soapstone countertops look truly excellent. There are limitations to soapstone. There aren’t a wide variety of color variations, and no two pieces are identical, meaning it can’t be ‘reproduced,' or identically matched the way a composite can. 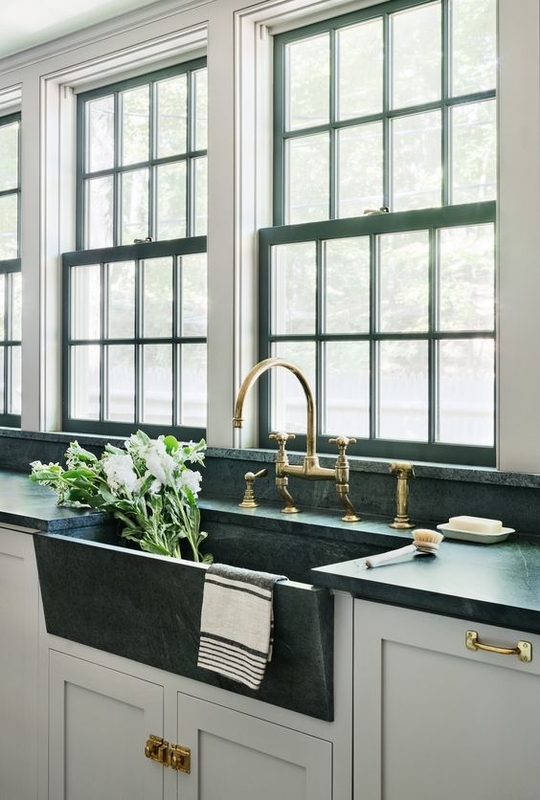 Since soapstone is easy to clean, it’s healthy, environmentally friendly, and a sound investment, making this classic material popular among minimalist homeowners looking for a unique countertop choice.